A graduate of University of Montreal and Harvard University law school, Ms. Des Rosiers is a former dean of civil law at University of Ottawa and president of the Law Commission of Canada. In 2011, Ms. Des Rosiers has her sights set on attacking threats to privacy and extracting secrets from governments via access to information requests. She has barely begun, predicted Mahmud Jamal, a constitutional expert at Osler's LLP. "Nathalie has made the CCLA into a truly national, bilingual organization for the 21st century," he said. "She is a natural leader - inclusive, respectful, and empowering of her team. 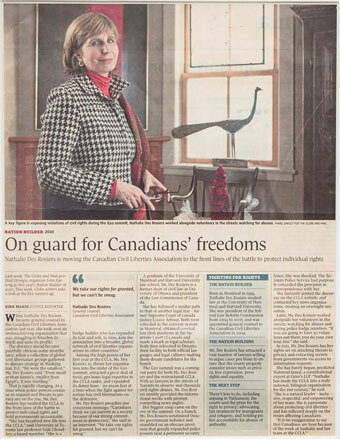 She is passionate about protecting civil liberties and has reflected deeply on the issues affecting Canadians. Born in Montreal in 1959, Nathalie Des Rosiers studied law at University de Montreal and received an LLM at Harvard. She practised for several years at Lerners LLP, in London, Ont., and then became dean of the civil law section at University of Ottawa. She was president of the federal Law Reform Commission from 2004 to 2008, and was appointed general counsel to the Canadian Civil Liberties Association in 2009.